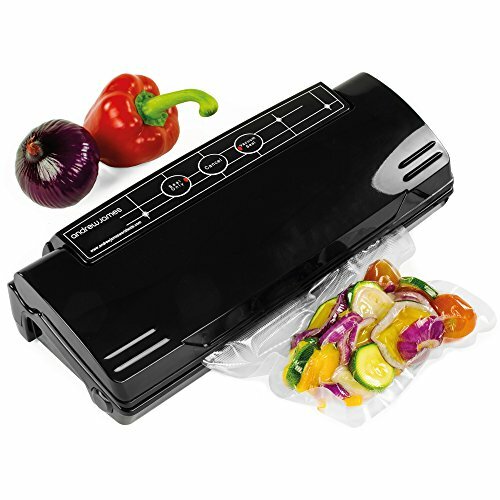 2 IN 1 VACUUM SEALER WITH ONE TOUCH OPERATION — The Andrew James 2 in 1 Food Vacuum Sealer Machine uses a rapid air removal process powered by a 110 Watt Motor which can remove up to 9 litres of air per minute operating at 0.75 bar. Complete the one touch sealing process powered by using the heated strip to seal the bag, ready for freezing, storing or cooking. 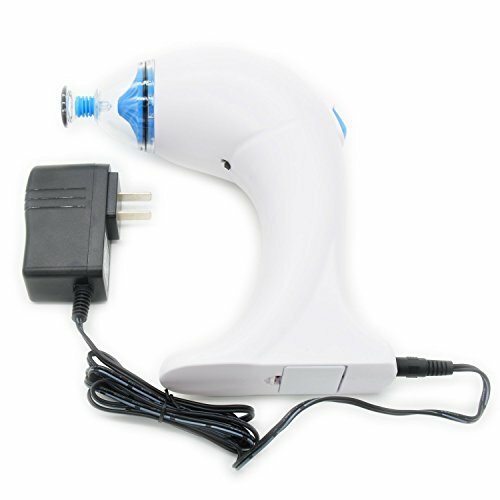 The machine also features a storage compartment for the vacuum packaging. KEEP FOOD FRESHER FOR 5X LONGER — Keep foods like raw meat and fruit and vegetables fresher for up to five times longer as the vacuum sealing process inhibits the growth of bacteria. This means that you can stock up at your weekly shop without worrying about food going off or spoiling before you have chance to use it. You can use the Andrew James Vacuum Sealer for vacuum storage of important paperwork to preserve their condition, and to keep valuables such as jewellery protected. 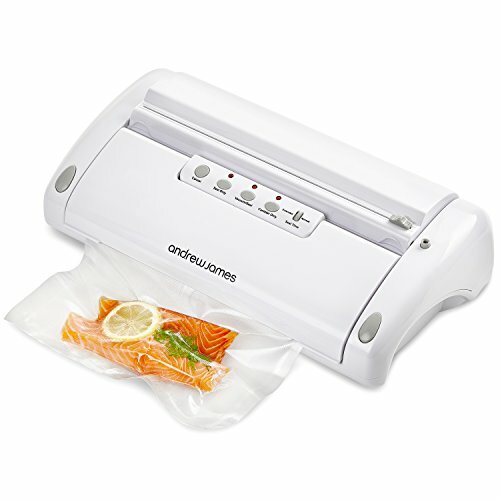 SAVE ON WASTE, TIME, MONEY & SPACE — The Andrew James Food Vacuum Sealer Machine offers a convenient and economical food storage solution. 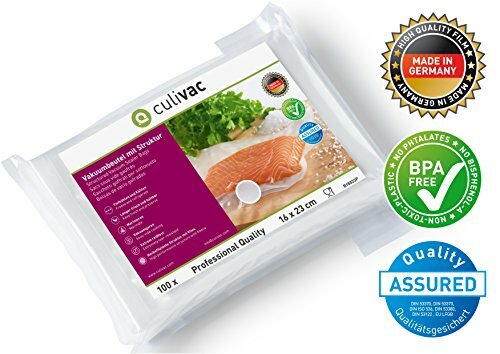 Buy food in bulk at a cheaper price without worrying it will rot or go off as you can use the Vacuum Food Sealer to preserve your fresh ingredients until you are ready to use them. You can also use the machine to prepare meals in advance for the week ahead which can then be stored in its most compact form then reheated at your convenience. 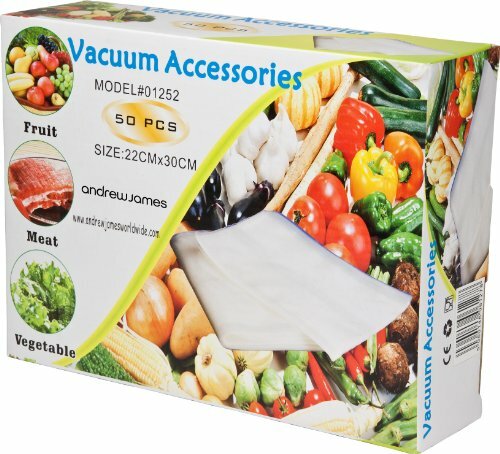 COMMERCIAL GRADE FOOD VACUUM SEALER — The Andrew James Commercial Food Vacuum Sealer offers exceptions flexibility when it comes to vacuuming and sealing food and valuables. Housed in high quality stainless steel, with a convenient handle to make operations easier, this machine is suitable for heavy domestic use as well as for commercial settings such as professional kitchens. KEEPS FOOD FRESH FOR LONGER — Vacuum Sealed food can stay fresh up to 5 times longer because all of the air is removed from around the item. 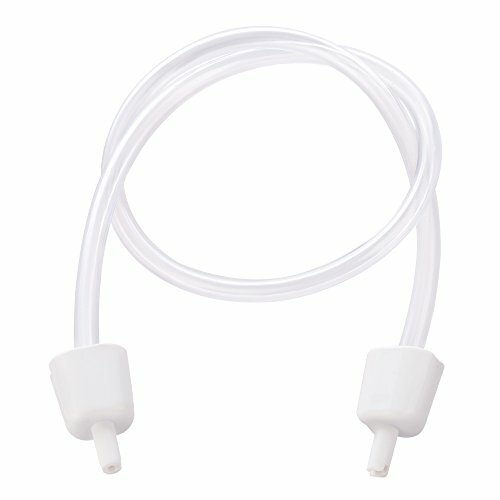 This prevents harmful bacteria growing and making the food go ‘off’. It’s also why this machine is great for protecting valuable paperwork and jewellery. 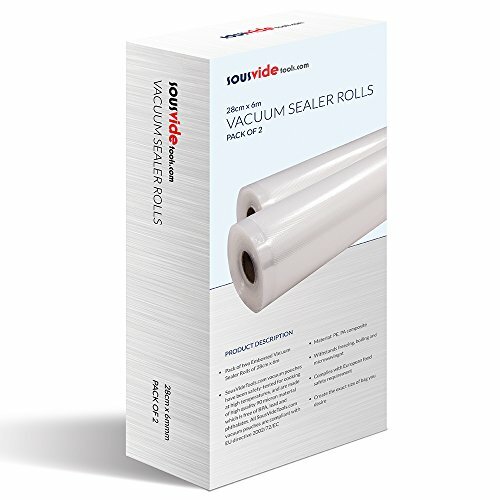 This vacuum sealer machine comes with 10m of food sealer roll to get you started. It also has a built in roll cutter to make creating bags simple. SOUS VIDE, MICROWAVE, FREEZER, DISHWASHER SAFE — Vacuum sealing is the ideal companion to sous vide cooking but it can do much more. Using these bags can prevent items suffering from freezer burn when stored at very low temperatures and they take up less space than traditional storage tubs. They can be used in the microwave to defrost, reheat or cook food and cleaned in the dishwasher for reuse. 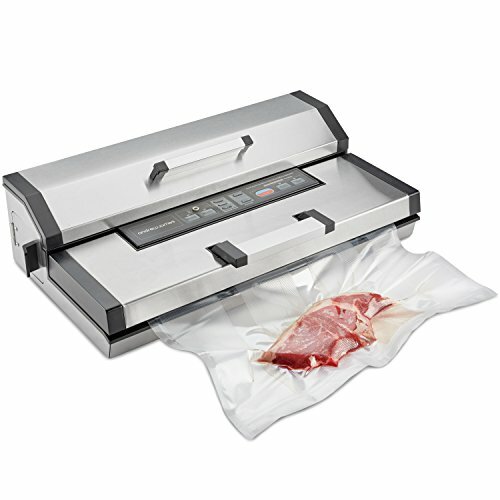 The Andrew James vacuum sealer bags keep food fresher for longer. 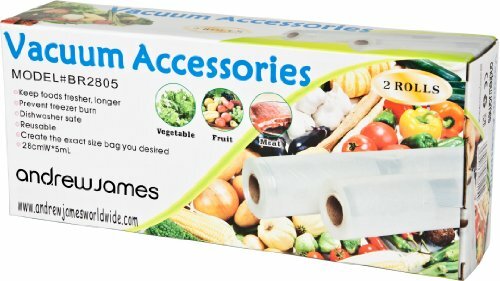 Great for freezing food and prevents freezer burn. 28cm of roll in total (2 x 5m rolls). 50 bags, 22cm wide x 30cm long. 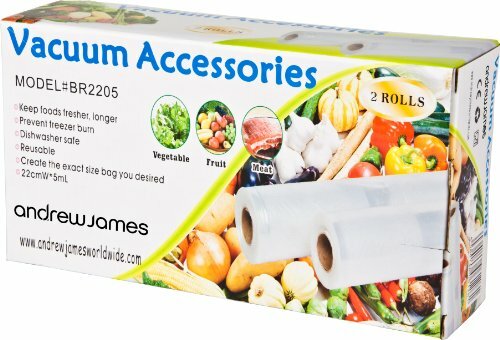 22CM WIDE FOOD SEALER ROLLS – The Andrew James Food Sealer Rolls are a great way to store fresh ingredients and cooked food, you end up throwing away less food and therefore save money. These rolls are 22cm wide and the pack includes 2 x 5M rolls. Because you can cut these bags to the size you need, there’s less waste than with traditional food sealer bags. REUSABLE; DISHWASHER, MICROWAVE & FREEZER SAFE – Once you’ve made and sealed a bag from the role you can reuse it again by snipping off the sealed end and washing it out. Either do this by hand or in the dishwasher. You can also put these bags in the microwave to reheat cooked foods, they also prevent freezer burn if you want to store something at sub-zero temperatures. And, of course, they are perfect for use in sous vide cooking. 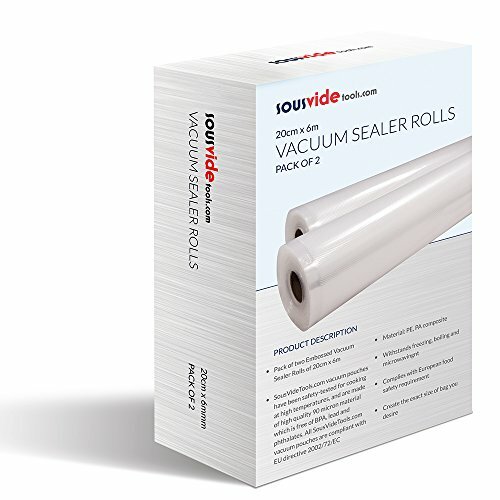 KEEPS FOOD FRESH UP TO 5X LONGER – Sealing your food in the bags from this roll prevents contamination from dust, dirt, moisture and germs in the atmosphere. If you vacuum seal the food you remove all of the air so it is much harder for any bacteria in the food to grow, which prevents your food from going ‘off’ as quickly. 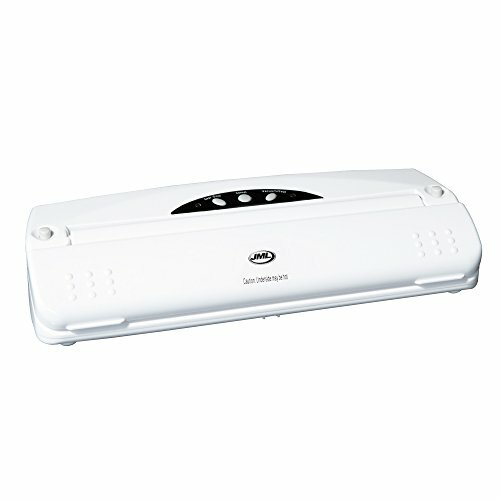 DOMESTIC FOOD VACUUM SEALER WITH ONE TOUCH OPERATION — The Andrew James Domestic Food Vacuum Sealer Machine uses a rapid air removal process powered by a 110 Watt Motor which can remove up to 9 litres of air per minute operating at 0.75 bar. Complete the one touch sealing process powered by using the heated strip to seal the bag, ready for freezing, storing or cooking.